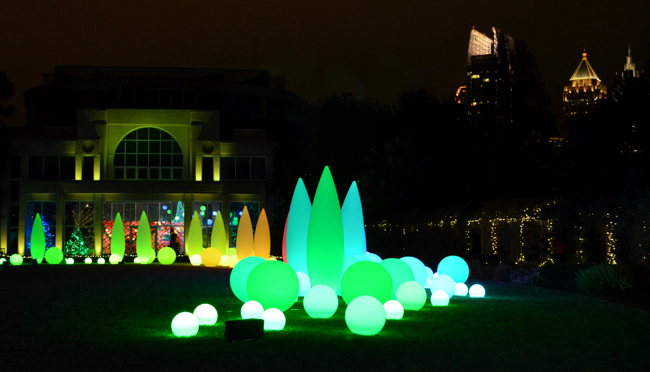 As of this moment, there are still tickets available for tonight's "Garden Lights, Holiday Nights" exhibition at the Atlanta Botanical Garden. In talking with many of my friends who didn't make it last year—the inaugural year, some of them have come across sold out nights this year, not realizing the grand popularity of the exhibition. So..if you've not yet been, I highly recommend purchasing your tickets online so that you don't risk getting there just to find out that they're sold out for the evening. And don't think that just because Christmas has passed that they won't be sold out...they're already sold out for tomorrow night!